My strong, encouraging and beautiful friend has been so vulnerable and has opened up her heart in the most honest and inspiring devotional. 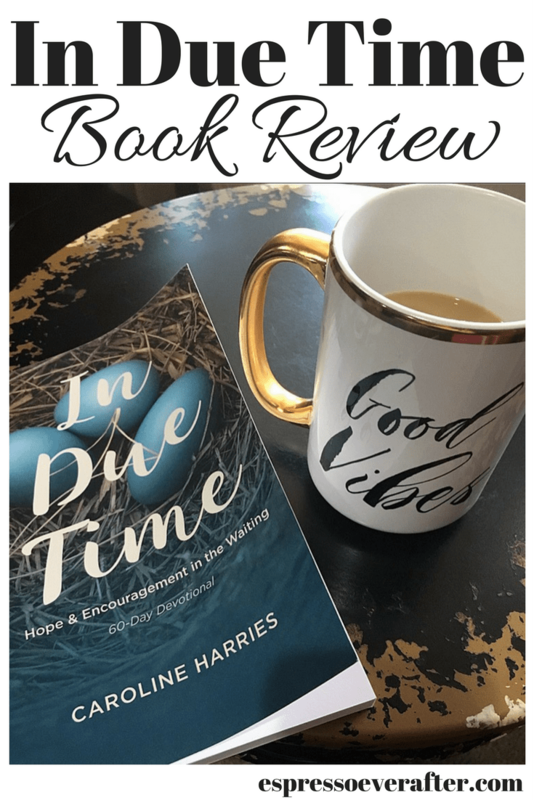 In Due Time is a 60-day devotional where Caroline Harries shares her own story, her losses and longings as well as shares the truth from God’s word to declare that God is good in the midst of waiting. No matter what you are going through, this devotional shows you that daily steadfast time in the Word will give you hope and encouragement in these times of troubles. I love how each daily devotional seemed to find me right where I was, and was the perfect inspiration I needed each day. God truly meets us in our waiting! 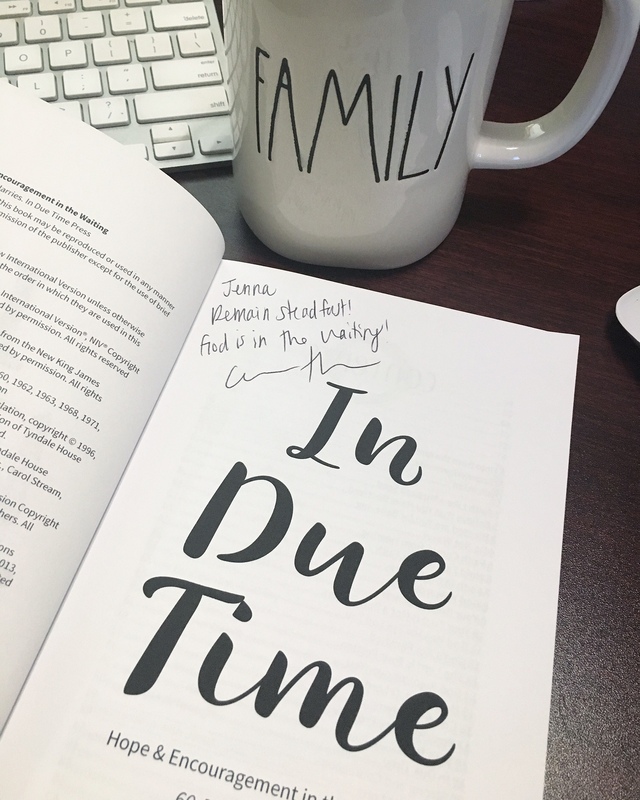 If you would like to purchase In Due Time devotional – Click HERE! If you know someone in your life that is going through a time of waiting, this is the perfect gift to bless them with. BONUS – it comes in cute packaging! Want to learn more about Caroline’s story visit her WEBSITE & follow her daily journey on INSTAGRAM! 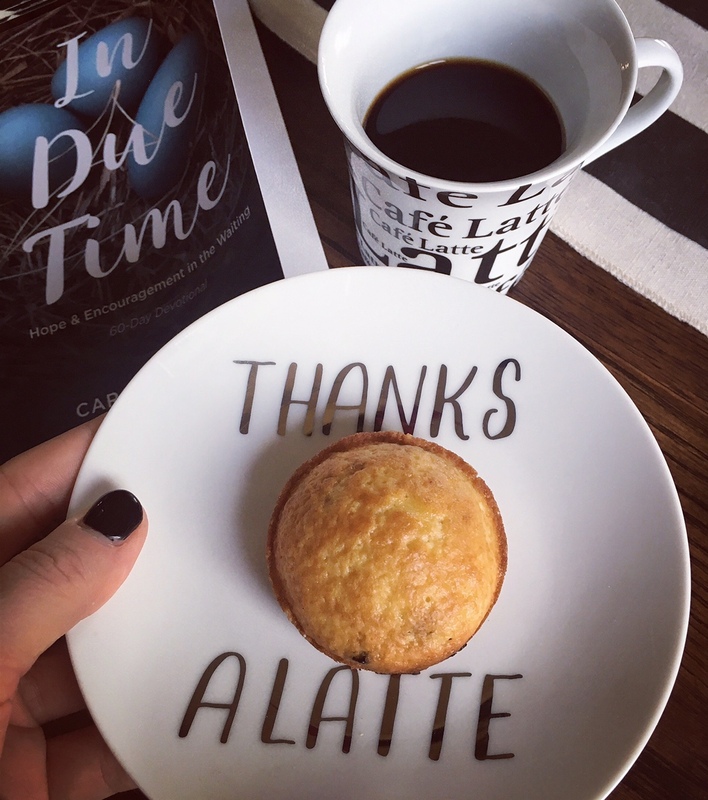 Use discount code : espressoeverafter10 : for 10% of your book order + a free bookmark! Click HERE to get started! I love what Caroline wrote in my book, “Jenna, Remain steadfast! 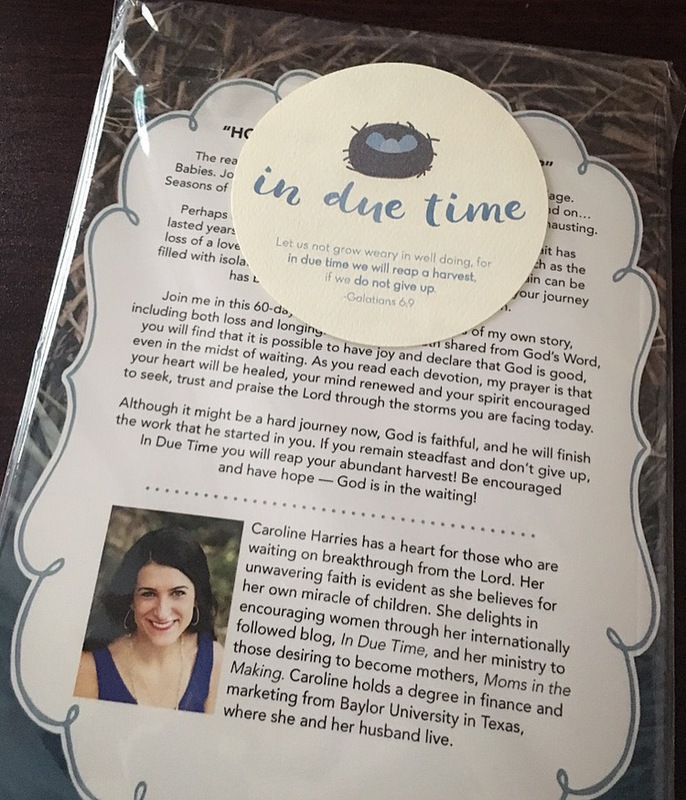 God is in the waiting!” Thank you Caroline for writing this devotional and for opening up and touching so many with your story. I received this book in exchange for an honest review. All thoughts and opinions are 100% my own. This post contains affiliate links. If you decide to make a purchase through my link, I will make a small commission for it. This doesn’t cost you anything additional. These commissions help to keep the rest of my content free. Thank you! It is a very special devotional! You are such a sweet friend! I love Caroline and her dedication to the Lord! Thank you Chanel. It is a beautiful devotional written by a fabulous heart! This is great! I have felt all those feelings above, learning to deal with them through God too. Love the idea of this devotional. Thank you Angela. This is a special devotional and inspired by a beautiful woman. Check it out! 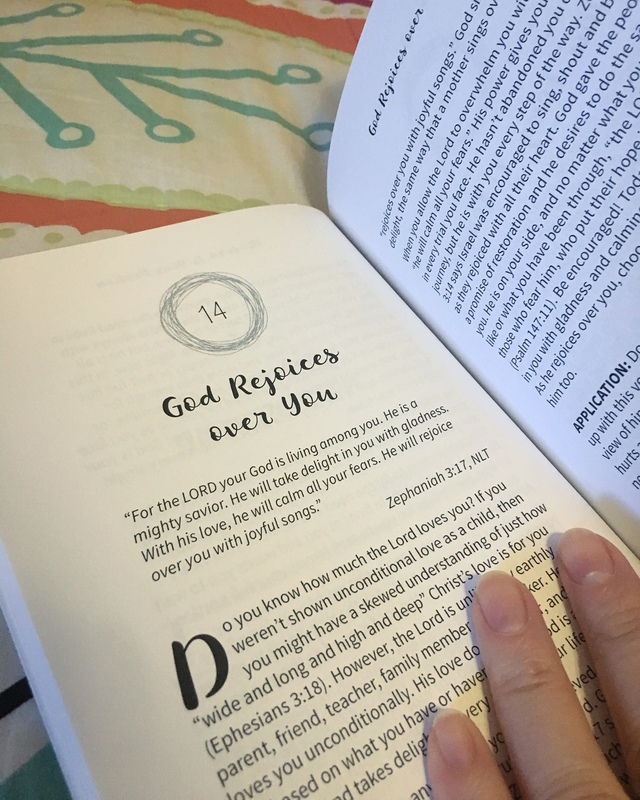 I love hearing about god devotionals out there. Thy speak from experience and those are the best. Thank you sharing. Anytime Annette. This is a good one! Enjoy! So awesome! Would love to read it! Raven – She is awesome and you will enjoy the read! I am so glad you posted this! It’s been on my to read list! Any time girl! You will like it! I’ve heard wonderful things about this devotional! Jaclyn – It is so good and inspiring! I haven’t heard of this devotional. I’ll have to check it out. You will really like it, Tamara! Love Caroline! I keep meaning to pick this up- am definitely going to now! Stephanie – She is the sweetest and it is so well written!